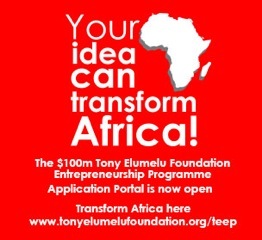 The Tony Elumelu Foundation Entrepreneurship Programme is Opened! The Tony Elumelu Foundation Entrepreneurship Programme represents a decade-long commitment to supporting African start-ups and entrepreneurs. It is committing $100 million to help launch and initial 10,000 entrepreneurs throughout Africa over the next 10 years, creating 1,000,000 new jobs contributing to $10 billion in revenue across Africa. The online application portal for the 2015 round of entries is opened and will close on 1 March 2015. Entries are opened to applicants from all 54 African countries and will be accepted in English, French and Portuguese.